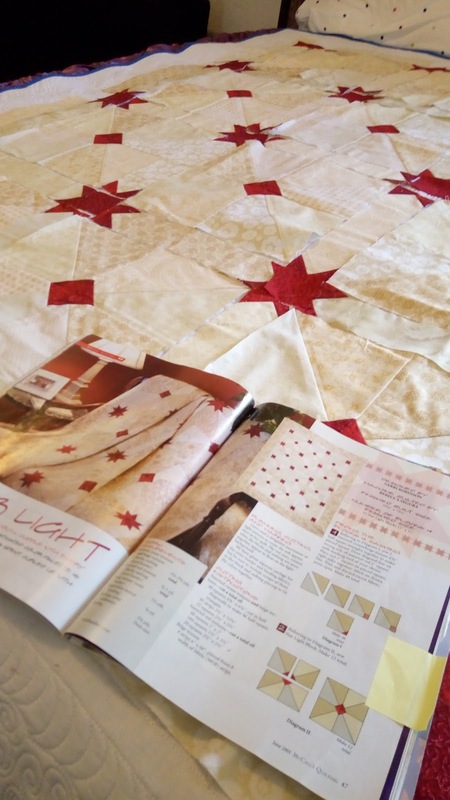 This simple but sweet pattern is called Star Light from APQ Magazine from 2012. I actually saw this quilt when my friend Jeannie-Kaye displayed it at our guild quilt show a few years ago. I just loved the simplicity of it and you just have to love the red stars. This quilt was started at our cottage several years ago. While at the cottage, I only sewed on rainy days. The last couple of summers at the cottage were beautiful so it's no surprise that this little project wasn't finished. Well, it's about time that it gets done. So it's here in Florida with me. After spending some time finishing up a few blocks today, all the blocks and sashes are laid out on the spare bed. Using my flip and stack method, it will be easy to sew it all together. Then I will add the final border later in the week. So, that will make two UFO's done. When packing up projects to take with me last month, I didn't realize that my little UFO strategy would work so well. After this Star Light project, I only have two more to go. Maybe I should have brought more!! There are certain things I always need to order or re-order when snowbird season comes. One of the things was small labels for my little projects. I usually order the gray color because it goes with lots of things...but this time I tried a couple of different colors, and fonts and sizes. I just got them in the mail and I'm pretty pleased. Just in time too. See, the local quilt shop here has moved to a bigger and better building. They are planning a grand re-opening and asked if I would bring in some samples from classes that I lead. Because I now have a wealth of labels, everything gets a label. Tomorrow I'll bring the labelled samples with me when I visit the new store for the first time. Some of you will ask where I order the labels. The name of the company is the Dutch Label Shop . I order the basic woven labels. Their website is so fun and easy to use. Chose colors, fonts, size and quantity. Have fun. Edit** Guess what guys, Abby from the Dutch Label Shop has given my friends an opportunity to get a discount if you order. This code is good until the Feb. 10, 2018. Just enter quiltknitrunsew15 in the promo box. 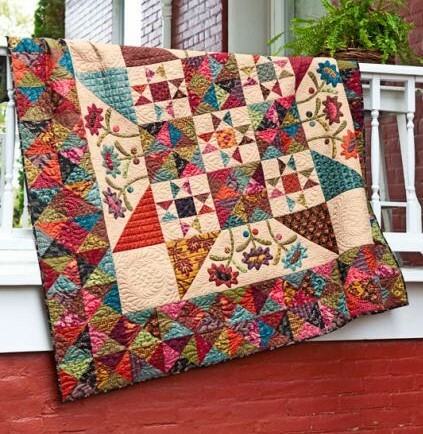 Late Bloomers was one of 4 quilt kits that I've brought with me for my winter sewing. It was started last year and I had the hourglass blocks done before I gave up on it put it away. 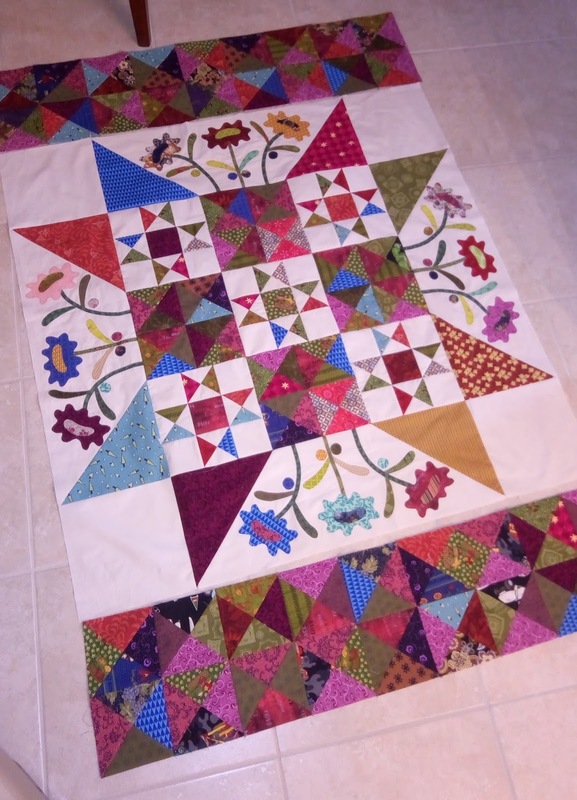 Well in the last seven days, I've picked away at squaring up every hourglass block and put together most of the quilt. I've probably worked at it for no more than 1 hour per day. I'm now working on the two side borders and probably only a couple of hours away from having the top done. It's a good size, it will be 60" x 60" when finished. It happens to be the perfect width for my entryway and after it's quilted, it will replace my Winter Wonderland. I love the whimsy and movement in the flowers. I love that it's a star block and a nine patch. I love even more that I used all fabrics from my scraps and stash. My mind is now wondering on what kit to work on next. Stay tuned. While I don't make resolutions, I am excited for my 2018 sewing plans. It's my intention to work on a couple of quilts that have been unfinished. 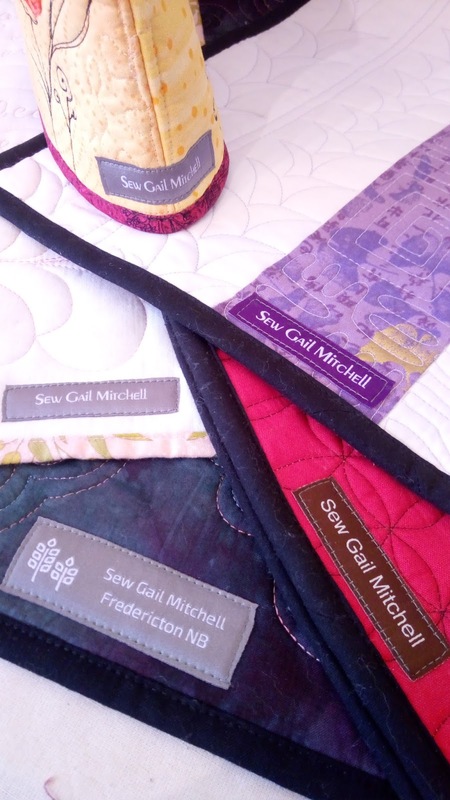 They are kits that are partly sewn. Today I started working on this Late Bloomers quilt from American Patchwork and Quilting April 2012 magazine. I had cut myself a kit, and bagged it for later use. I think it was two years ago, I started working on it, but found the instructions needed lots of concentration to figure out all the different sizes of the hourglass blocks. It could have been just me at the time... to many things going on... so I just put it all back in the zip bag and said I'll do it later. Well later is now - January 2018. I've familiarized myself with all the components and the pattern again.... I'm finding the instructions just fine. I am sewing hourglass blocks. The next step is to trim them to the exact size. I forgot my small 6.5" squaring up ruler so I'll need a trip to the fabric store to buy one.